Japan beat Team Israel last Wednesday to eliminate the “Mensches” from the World Baseball Classic (WBC). Nonetheless, Israel did far better than anyone thought possible. Manager Jerry Weinstein and the guys were not expected to even qualify for the tournament and the oddsmakers pegged them at a 200 to 1 longshot to win the whole kaboodle. Israel defied expectations by not only qualifying for the series, but making it into Round 2 until the Netherlands and Japan blocked their run in the Tokyo Dome. Still, the guys did phenomenal and my poker-money says that they will do so again in 2021. The primary question for those of us covering the Team Israel, however, is just what to make of their terrific effort? Is there some larger meaning that can be culled? Does the Mensche on the Bench, as conjured by outfielder Cody Decker, really have Kabbalistic powers? I suspect not, but what is clear is that Ha’aretz – Israel’s version of the “paper of record” – is not a big fan of Team Israel. While it is obviously true that not all Jews are citizens of the sovereign state of Israel, we are part of the nation of Israel because we are part of the Jewish people. The very word “Israel” – whether Ha’aretz likes it or not – refers to both the Jewish State as well as to the Jewish people as a whole. The general policy of the State of Israel since 1948 – and of the yishuv in the British mandate – was to hold Jewish people close as brothers and sisters as those of us in diaspora do likewise. I am not convinced that Ha’aretz is quite on-board with this old-fashioned notion, however. 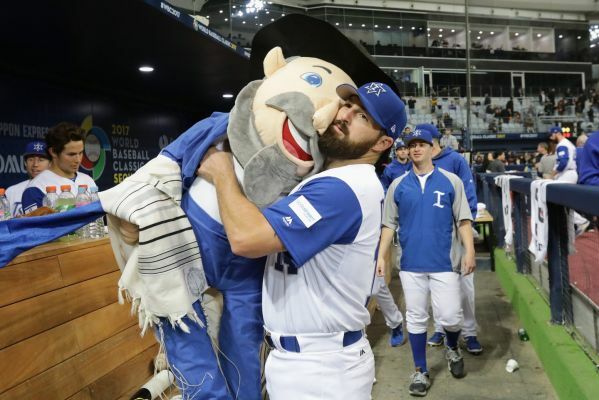 Once it became clear that Team Israel was doing well in the tournament – after their surprise upsets in the preliminaries in Brooklyn, New York, and then the amazing sweep at Gocheok Skydome in Seoul, South Korea – it was just too much for Ha’aretz. In two articles attached to their rather flat description of Israel’s victory over Team Cuba in the first game of Round 2, Ha’aretz spat at their American bat-wielding brothers. On March 9, Simon Spungin portrayed Team Israel as comprised of foreign usurpers and on March 12, Chemi Shalev did the same. Sure, they’re Jewish and, by Israeli law, they could become Israeli if they wanted to. But they’re not. They are Americans and they have been brought in as ringers, plain and simple. This is unjust, malicious, and the title oozes condescension. The point of the World Baseball Classic is to promote baseball to an international audience. This is why any player eligible for citizenship in any country may play for that country and that is why we see Major Leaguers from the United States playing for teams all throughout the world. In fact, Team Israel does not have a single player currently in the bigs, but this is not true for other countries who have non-national big league stars playing for their country. We know what you’re thinking. Why is a de facto Jewish-American all-star team representing Israel? WBC eligibility rules are more flexible than those which govern most federated international competitions, including the Olympics. By WBC rules, a player is essentially allowed to compete for a nation if he fulfills the criteria whereby he would be eligible to become a citizen of that country. Israel isn’t the only country that benefits from this rule, but its religious status makes for a unique situation among WBC teams. The nation’s Law of Return allows anyone with a Jewish parent, grandparent or spouse to become a citizen. MLB established this policy with the idea of growing the game globally. After all, a tournament where a handful of established teams crush inexperienced competition would serve as an insincere invitation to nations where MLB has growth interest. Notice how much more kindly that ESPN is to Team Israel than is Ha’aretz. Is there any other newspaper in the world that represents itself before an international audience as the voice of that country that so fiercely attacks its own sports teams during international competitions? The WBC did not devise this rule out of some nefarious Zionist plot to rob more virtuous people from their proper baseball glory to the benefit of the Jews. Someone needs to inform Ha’aretz that the WBC created this rule because they want to promote the game and hope to see it permanently reinstated as an Olympic sport which is why the best players from anywhere in the world can play for any team so long as they are eligible for citizenship in that country. Why would Ha’aretz go after Team Israel if not to niggle at political divides between Jewish Israelis and their brothers and sisters in the diaspora? We may view it as a natural expression of the eternal link between Jews and their Promised Land, but one can hardly blame others if they take a more cynical view of a baseball team that uses God�s Covenant with Abraham as a pretext for manning their pitching roster. Tell me, does this just not drip with arrogance and condescension? None of this, obviously, has anything whatsoever to do with “God’s Covenant” because the game – Billy Crystal’s cosmic baseball dreams aside – has nothing to do with theology. I am no one’s idea of a rabbi, for chrissake, but I am pretty sure that baseball does not figure highly in Torah learning. The pitching roster reflects the team and the team reflects Israel and Israel reflects the Jewish people. And that is precisely what Ha’aretz cannot swallow. We all know that Ha’aretz pays money for anti-Semitic anti-Zionists like Amira Hass and Gideon Levy to retch hatred at Jewish people who do not toe their political line. For example, Hass actually believes that stoning Jews in Israel is “the birthright and duty” of Palestinian-Arabs. So, while many of us have long understood that Ha’aretz is the toxic little Israeli brother of the New York Times, I never figured that they would actually hurl poison at Jewish ballplayers in order to get a kitzel behind the ear from New York. As far as I am concerned Ha’aretz can go straight to hell. It speaks neither for the Jews in Israel, nor for those of us in diaspora. It speaks only for the Democratic Party which, itself, is neither a friend to the Jewish people, nor the Jewish state. It might as well bring on anti-Semitic anti-Zionist and Democratic Party activist Linda Sarsour to decide its editorial policies.